The state’s location in the middle of the country has turned Kansas into a major transportation hub with many employers in the aviation and railroad industries. In addition to serving as an agricultural center for America, Kansas is making progress as a leading supplier of oil, natural gas and industrial materials for the country and internationally. It is one of the fastest-growing bioscience hubs in the United States and has also emerged as a leader for service companies, according to the Kansas Department of Commerce. As a result, demand for skilled trades workers in these fields remains strong. Read on to learn more about vocational and trade schools in Kansas, career prospects for graduates, and resources for students and working professionals. Students in Kansas can choose among many vocational and trade schools across the state. Students can decide to attend a career college, community college or vocational school and pursue programs in growing fields in the state, such as office technology and medicine. Our ranking of accredited Kansas schools takes into account numerous factors, including tuition rate and financial aid. Kansas City Kansas Community College offers 23 Associate in Applied Science degrees, 18 Associate in Arts degrees, 22 Associate in Science degrees, 20 Associate in General Studies degrees and more than three dozen technical certificates. The school has articulation agreements with dozens of other learning institutions across the state. Some students are allowed to select a class that interests them from among a predetermined selection of core electives. If students interrupt enrollment for more than two semesters before re-entering, they will graduate under the college catalog for the year they re-enter. Hutchinson Community College offers AA, AAS, AS and AA degrees, as well as a wide range of certificates in various concentrations across 15 areas of study. Hutchinson uses the National Institute for Learning Outcomes Assessment Transparency Framework as the basis for its Educational Quality Assessment, which is designed to measure and improve its academic environment. HCC maintains a volunteer center, which partners interested students with community service projects in Reno County. The campus also offers a wide range of entertainment and activities, including athletics and fine arts productions, and provides links to community activities such as the Kansas State Fair. Students at Dodge City Community College can pursue an Associate of Arts degree, Associate of Science degree, Associate of General Studies degree and Associate of Applied Science degree. Each degree has the option of a variety of majors and concentrations. Advisors work closely with students to help with a seamless transition to a four-year institution after they complete a two-year degree. For students who choose to live on campus, the college offers four on-campus halls for student housing, which provide suite-style living. The school is accredited by the Higher Learning Commission, North Central Association. Prospective students at Barton can choose to pursue two-year career programs, as well as two-year degree programs that are designed to transfer to four-year schools and convert into bachelor's degrees. Degree options include Associate in Arts, Associate in Science, Associate in General Studies and Associate in Applied Science. Degree program consist of general education courses, which are usually non-professional and non-developmental. The campus offers students a variety of creative outlets, including music, theater, student recitals, dramatic productions and storytelling events. Students have the opportunity to participate in fine and performing arts activities directly or as audience members. Cowley offers more than 80 programs of study that include both transfer degrees and career-ready pathways. Students can attend the Arkansas City campus, the Mulvane Center, Wichita Downtown or the Allied Health Center, depending on their location and their preferred course of study. The campus is home to a wide range of clubs and associations, and students are exposed to entertainment, performances and athletic events. Students are provided with academic support, and those who are interested in volunteering will receive opportunities to participate in community service programs, humanitarian efforts and beautification projects. 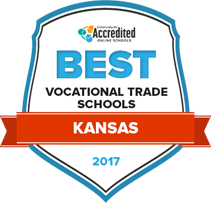 Whether students are interested in industrial careers, want to work in health services, or are considering careers in agriculture, they can find a variety of accredited programs at reputable vocational and trade schools in Kansas. Kansas is home to 26 state-approved public technical and community colleges. The educational track can begin as early as high school where students can enroll in technical courses tuition-free, thanks to Senate Bill 155 which provides state dollars to cover the costs of college tuition for high school students. Still, many choose to complete a program at a vocational or trade school immediately after graduating high school. Starting salaries in Kansas for career and technical education graduates range from $25,000 to $45,000 a year. By 2018, 64 percent of jobs in Kansas will require workers that have some form of post-secondary credential. 10 percent of job vacancies in Kansas in 2015 listed vocational training as an educational requirement. The Kansas Board of Regents reports that 10,390 students participated in post-secondary technical courses during the 2014-2015 school year. Those enrolled in one of the 26 public technical and community colleges in Kansas can complete a certificate program or associate’s degree program within one to two years and enter the workforce immediately after completion. The average cost of tuition at Kansas public technical and community colleges is $2,665 per year; those who enroll while still in high school can offset these costs and also take advantage of state-provided benefits, such as covering the cost of transportation for high school students to get to their local community or technical college. To further support those who wish to continue their education and improve their skills, the state offers flexible credit transfer policies. The Kansas Board of Regents sets the guideline for a direct transfer, where approved courses are transferred among all Kansas public postsecondary institutions, and a Reverse Transfer where the student can earn an associate degree when working toward a certificate program or other degree program. The following table illustrates the distribution of certificates, associate degrees, and bachelor’s degrees earned in Kansas compared to the national average. The Kansas Department of Labor projects 3,208 annual job openings for those with a post-secondary, non-degree education through 2022. Top occupations include health service jobs, such as personal care aides, registered nurses, and nursing assistants. Other in-demand occupations include administrative assistants and customer service representatives. Wichita and Kansas City are the two major cities in Kansas with career training centers and vocational schools. Students can also attend state-approved schools in Topeka or Manhattan. Wichita is home to several community colleges, a technical institute, and beauty schools. Those interested in dental or nursing careers may choose to study at Wichita State University for accredited health career programs. Wichita produces more than 30 percent of the world’s aviation aircraft, according to the Kansas Department of Commerce—leading to the city’s recent nickname as the ‘Aviation Capital of the World’. As a result, many trade schools in Wichita specialize in aviation degree programs, giving students a chance to specialize in aviation mechanics, manufacturing, and business operations. Major aviation employers in Wichita include Spirit AeroSystems, Cessna Aircraft, and McConnell Airfare Base. For those seeking non-aviation jobs, employment opportunities are plentiful in the areas of municipal government, food service and packaging, education, and technology. Wichita is home to the Wesley Medical Center and the Robert J. Dole VA Medical Center that hire nursing assistants and other health service workers. Provides information about the labor market with industry and occupational outlooks, a monthly labor report, wage surveys, and information about the state’s economic conditions. Useful for students and working professionals choosing a career path or exploring job and career opportunities in specific areas of the state. Information about the Kansas Career Clusters & Pathway Model and standards for all CTE programs across the state. Maintained by the Kansas State Department of Education. Comprehensive list of in-demand occupations, credentials and certifications required when entering the workforce, and average annual wages of each occupation. Compiled by The Kansas Board of Regents. The Kansas Postsecondary Technical Education Authority makes recommendations for improving or enhancing technical education programs throughout the state. The website includes strategic priorities and reports on latest initiatives that affect CTE programs. Complete list of approved courses for guaranteed transfer among any Kanas public education institution in the State of Campus. Includes course equivalency guides and information about the Reverse Transfer policy that grants students a degree as they earn additional certificates or work towards another degree program. Designed for workers that want to explore career interests and connects with Kansas employers that will help them reach their goals. Includes planning tools of students, parents, job seekers, and workforce centers. Registration is free and job seekers can store goals and achievements in an electronic portfolio to share with prospective employers. Includes information about the KANSASWORKS workforce center that links users to employment opportunities throughout the state and information about obtaining a Kansas WorkReady! certificate. Comprehensive database of available state jobs, provided by the Department of Administration. Includes job opportunities for skilled workers an information about pay plans, the Governor’s Intern Program, and agency contacts.